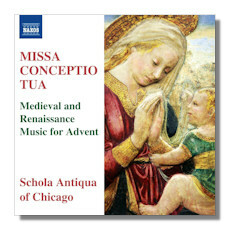 Pierre de la Rue: Missa "Conceptio Tuo"
This is an absolutely beautiful disc, crowned by the world premiere recording of the mass by Pierre de la Rue (1452-1518). In my mind, the Catholic Church has no seasonal music quite like her music for advent, and the other denominations of the world are not far behind. If you're sick of your usual radio dirge through the season, and not in the mood for choral evensong, this is an unusual and moving holiday program to consider. The very simple, but undeniably gorgeous antiphons that open the disc are sung purely and elegantly. They form the basis for the great advent hymns and carols that would follow in the centuries to come. The de la Rue Mass follows, for male singers. I'm not too crazy about the voices here; there are groups out there that would likely make this music sound prettier still. Yet there's no denying the craftsmanship on display, even if the tenors of the Schola Antiqua are an obvious weak link. The music itself is lovely, though. From there, we are back to chant for a track. Alma Redemptoris Mater is simply perfect, and shows the general superiority of the women's voices in the group. The three carols are a nice touch; here everyone sings very well. I've heard "There is no Rose" in a number of different arrangements, and this is one of the nicer ones. I assume it's also the original. As for the latter two carols, the "Hail Mary" is notable for being a very early work in which this prayer is in English, even with several liberties taken. "Nova, Nova!" is one of those fun little carols that you could see being sung as one marched from town to town. In the final analysis, the Mass is lacking in polish, but everything else is well worth your time!